Home » Blog » Blessed are those that laugh, eat and camp together for they have felt love. I attended a parenting workshop earlier this year and one of the speakers gave an interesting account of how they spent time as a family. He mentioned a lot of activities that they took part in as a way of spending quality time as a family. And then it got me thinking, how many of us have time to play as a family? How many of us really sit together during meal times? The world has become a very fast world, the rate at which it is orbiting seems to have gained momentum. I thought also about the intra family relationships, like Father-Daughter, Mother – Daughter, Father – Son, Mother – Son, Brother – Sister and so on and so forth. I thought to myself how special it would be it if became a part of our culture as a family to cherish all the different aspects of our relationships. Which leads me to my next point. Of Fathers, Daughters and everything in between, including the Mothers. Daughters are very special, in my opinion, because at some point in life we’ll have to let them go and become someone else’s wife, daughter in law, sister in law etc. Now this calls for special attention because the daughter has to be particularly trained to adapt to new environments, some of which are quite rough. (I know a few mothers in law who specialize in being impossible). Every time I look at my daughter I always think to myself; when the time comes to let her go, will my wife cope? Will I be strong enough to let go and hope that the family she’s marrying into will show her patience, love, kindness, tolerance? Will she be allowed to be herself? This is because that’s what we want for our daughter. But maybe she has other plans, like why should I even get married anyway? After all this is the 21st century and there are a million options. A Father who takes long drives and camps with his daughter prepares her for life in the future. Time spent with daughters is crucial and special. It brings you closer together. It helps them to be as open with you as possible. They should be able to come and ask you what a heartbreak really is. They should trust you enough, as Dad, to tell you that they suspect that their boyfriend is a two timing weasel. You are going to smile a bit because you understand what she’s talking about. You’ve been there before but that’s not to say it’s a good thing! In short, I think daughters have to have confidence in their fathers and to know that they’ll understand their situation. I understand that families are different today. Some daughters are raised by single mothers but if you can play the role of Father in any girl’s life, God bless you. And this is not to say that Mothers cannot play their part. In fact there are Mothers who do a better job than men do! My point is that if you’re a Father, take your daughter out on camping trips, long road trips, eat out together, watch a sad movie and cry together, be her pillow to cry on, share ideas, rewrite the script and most importantly, listen to her. Will boys always be boys? I’ve been in business long enough to understand that human beings thrive on love and affirmation. Growing up I always saw my mother as this amazing person with loads of love. She had the ability to calm things down. I remember running up to her every time my father pulled out his belt to sort me out. I’d go to her to seek refuge. She was wise enough to let me take my punishment like I was supposed to. She would be the same mother who’d shout at the top of her voice another time encouraging her husband to really smack the daylight out of me! Mother? I learned one thing from her actions, she wanted me to be responsible. She was teaching me to be a man. She was from the classrooms of old school, but Mother – Son relationships haven’t changed today. Mothers always want their boys to grow into responsible young men. No mother wants to visit her son in prison. Breaks their hearts. Mothers want sons who will treat their wives better that they’ve been treated by their husbands. Be the better man, my mother always said. So I grew up looking to marry someone like my mother – firm but compassionate, hard but loving and understanding. I found her. I grew up in different circumstances from the realities that I know today. There was no camping in our family, but we were all housed under one roof. There were no team building activities like we know them today. Everybody went on with their life, silently praying for years to go by very quickly so that they “could get out of here”. However, there were many things that we did as a family that brought about the unity. For example, meal times were standard for everyone. And we used to eat from the same plate! At one point we had two groups of four! Crazy. It was dog eat dog. You would not breathe until the plates were empty. It taught us how to survive in a world where everyone wants the same things. It’s about how desperate you want to get it. It’s about how swift you move. What’s love got to do with it? Today I’d say The family that eats together and camps together stays together. Time with our families is crucial. That is our main contribution in life, to spend quality time with our families and making memories that can always be referenced to in years to come. If we don’t spend time with family today, we’re teaching our children to be selfish, to only think about themselves. 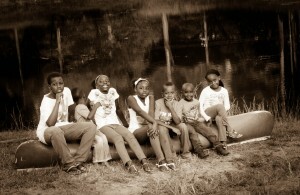 And they will forget us when we are much older because we’ve not taught them the true value of family relations. Let’s go camping and enjoy the outdoors and in the process find love for one another. After all love is meant to be felt. 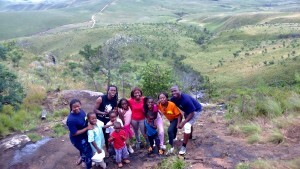 Visit www.adventurelandnyanga and tell us what your family does to stay together. Going all the way to the top of Nyangani Mountain, Zimbabwe’s highest peak at 2593m. #family challenge #get to the top.